Karthigai Deepam is celebrated on the full moon day of the Karthigai month which coincides with krithikai star. This year it falls on 5th of December. Karthigai deepam is considered as the extension of the Deepavali festival. The traditional neivedhyams (sweets) made for karthigai deepam are appam, pori urundai and jaggery based payasam. In our house, we make our regular adai for karthigai. Milagu adai is another traditional karthigai deepam recipe. My mom shared this adai recipe from a cookbook. It is slightly different from our regular adai. This milagu adai is made of raw rice and peppercorns instead of parboiled rice and red chillies. Usually for neivedhyams, par boiled rice or boiled rice is not used. 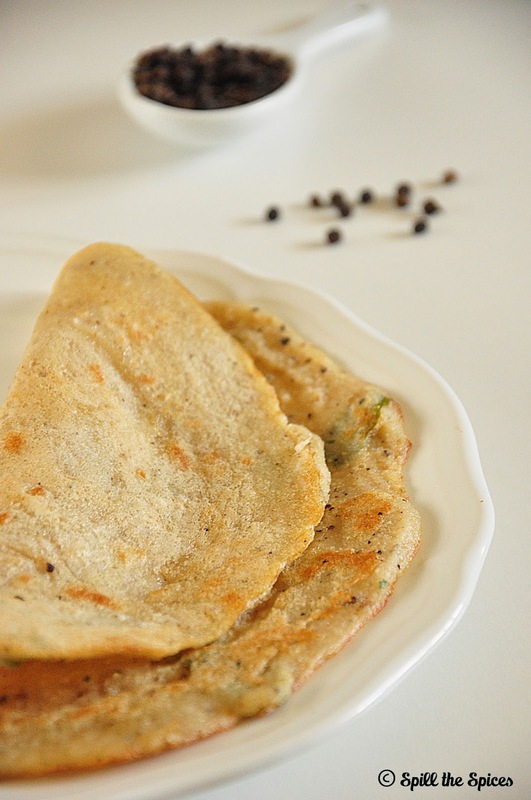 This adai is very healthy and can be made for regular breakfast too. 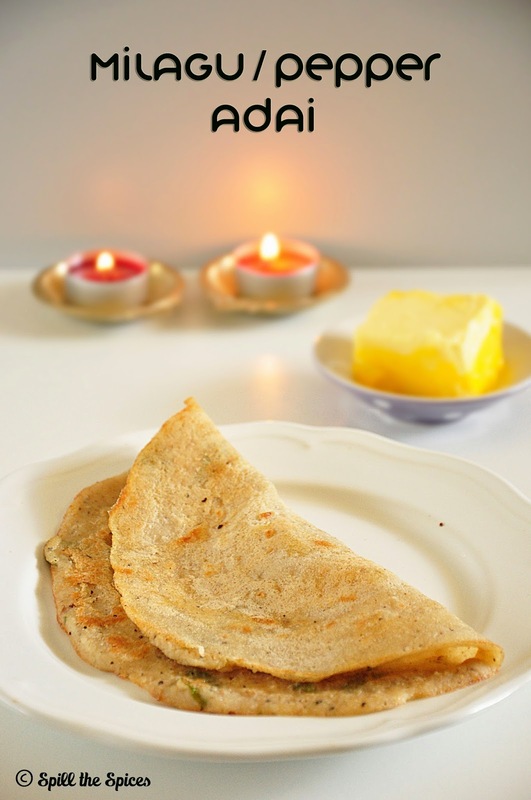 It tastes best with butter or jaggery. 1. Wash the rice and dals together and soak for 3 hours. 2. In a mixie jar add soaked rice, dals, pepper, jeera, ginger, asafoetida and 1 sprig curry leaves. Grind to a lightly coarse mixture adding little water. 3. Transfer the batter to a vessel and add remaining curry leaves, salt and mix well. Set aside for 1 hour. 4. Add required water to the batter and mix well. 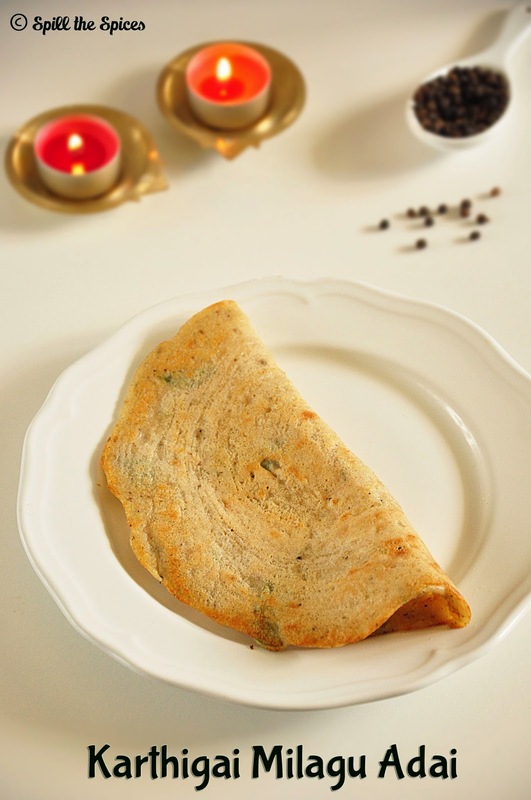 The consistency of the batter should be thicker than dosa batter. 5. Heat the tawa/griddle. Pour a ladleful of adai batter and spread it thinly like dosa. Pour 1 tsp oil all round the edges and in the center. 6. Cook till its golden brown in color. Now flip the adai and cook till the other side also turns golden brown. Serving Suggestion ~ butter or jaggery. The adai is usually made little thick but I prefer it thin and crispy. You can also add thin coconut slivers to the batter. very flavourful and perfect recipe!! this adai recipe is new to me. looks crispy and delicious..
Will try this soon..Never tasted it before. This is very new to me. Adai looks delicious. Nice pics. Best recipe for the for this festive time!! flavorful and healthy adai. will try this version next time..
How interesting and they look delicious too! Flavourful tasty adai. Perfect fort this season!! !